Read this today. I have a huge poster at the to of my stairs. 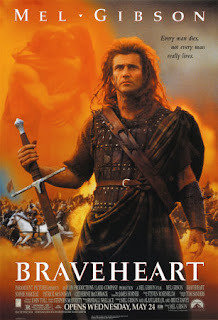 It has a picture of Mel Gibson as William Wallace advertising the movie - Braveheart. The Scottish coming out of me again. However the main reason I bought it was for the little quote it had in the background. "All men die not every man really lives." This short quote haunted me. Having reached the age of 45 I suppose that I am now past the mid point of life so you start to have thoughts like "What have I achieved? "If I wait to my funeral then it will be too late. A little exercise I once did on a class run by the Steven Covey organisation helped me get this in perspective. We were given 8 post it notes and asked to write down the 8 most important things in our lives. Be it role, relationship, etc. That was not too hard. Then he asked us to pick 4 to keep and 4 to throw away. Now that was hard but after a while I did it. Then he said pick 2 and throw 2 in the bin. That was impossible. First of all I refused but eventually with tears in my eyes I did it. (in fact I can feel the emotion rising up inside me as I write this) Then he said pick one. Actually by that time it was a little easier for me anyway. I was left with the one thing that was most important in my life sitting on the table in front of me on a little yellow post it. Then the facilitator asked us what were we actually doing about it. What were we doing that made it clear that that one thing was the most important to us. That moment helped to shape my life. By the way we got all 8 post it notes back and they became the most important things. Sometimes I go off track but I still have the post it notes and sometimes I get them out lay them in front of me and refocus. What are the 8 most important things / people in your life. I've enjoyed following your blog for some time. This post is an absolute stonker (that's 'stonker' not 'stinker'). Really challenged me this morning!